We all know we should, but we can graciously take only so many house salads or side orders of steamed broccoli. There is a palatable alternative though. Three local eateries have turned vegetables from an afterthought to a delicious main event, with flavor to spare. Salads and wraps are made-to-order in front of the customer. A big hurdle to healthy eating is taking the time to wash, prep and creatively cook a variety of nutritious ingredients. 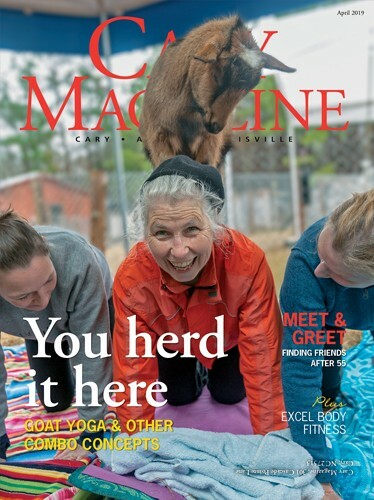 Caryite Michelle Woodward is on a mission to eliminate that challenge. 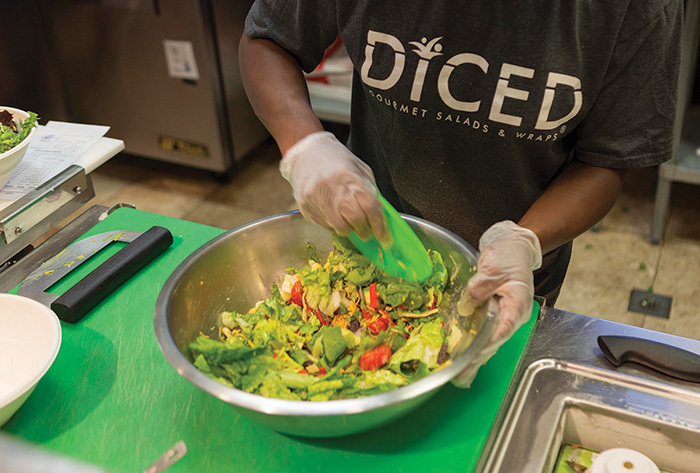 Owner and founder of Diced Gourmet Salads & Wraps, Woodward identified a need for convenient, healthy fare as a college student. Fresh food fast is the mission at Diced Gourmet Salads & Wraps, where you’ll find unique flavor combinations, quality ingredients and house-made dressings. Offerings include an all-star lineup of super foods: kale, spinach, avocado, almonds, quinoa, grass-fed beef and extra virgin olive oil, as well as countless other fresh vegetables, high quality proteins and house-made dressings. “Ingredients are our number one priority. We offer the highest quality meats and veggies you can find,” said Woodward. 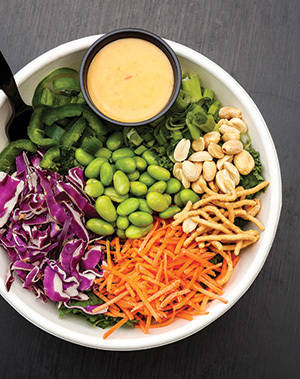 The Spicy Thai Salad with shrimp is Woodward’s favorite and features edamame, carrots, red cabbage, green onion, jalapeños, chow mein noodles and peanuts with Thai ginger dressing. 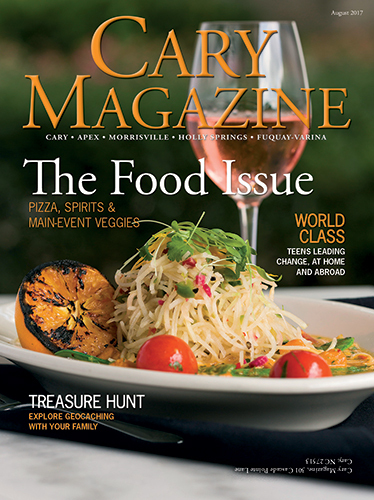 One of Cary’s longest standing and best loved restaurants, Maximillians Grill & Wine Bar has a history of farm fresh dining. 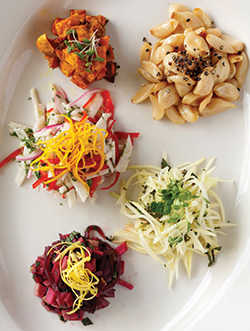 Spiral cut kohlrabi replaces noodles in a southwestern inspired vegetarian entree. “Before there were farm-to-table restaurants, Michael (Schiffer) was doing that out of a little Hardee’s building,” said current proprietor Margie Hennessee, recalling the restaurant’s early days and its original owner, under whom she and husband Will worked as sous chefs. Since acquiring the restaurant in late 2015, the Hennessees have preserved these traditions and added twists of their own. At first glance, the Maximillians menu reads like many upscale bistros — seared tuna, diver scallops, roast duck — and then you begin to notice the abundance of unique flavors and vegetable preparations. 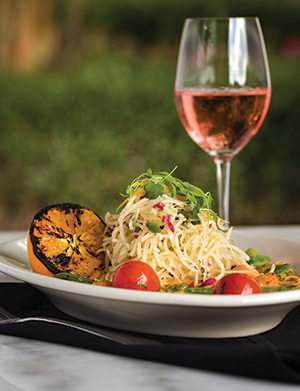 Parsnip puree, arugula, oven-roasted tomatoes and carrot-orange gastrique accompany the scallop entree, for example, and the airline chicken breast is served with a spaghetti squash and eggplant ratatouille — a far cry from a side of mashed potatoes or a bread basket. The menu at Maximillians Grill & Wine bar showcases vegetables from top to bottom, from the sauces and relishes to the side items, often replacing a starchy side like pasta. Any Maximillians’ entree can easily be made vegetarian, she says, but Hennessee prefers the made-to-order approach, which showcases the myriad vegetables on hand. One recent made-to-order creation featured kohlrabi (a relative of cabbage) spiral cut into “noodles,” served with watermelon radish, jalapeño and a smoked chipotle cumin cream with sweet potatoes and red onion, bell peppers, snow peas, heirloom tomatoes and cilantro — a veritable farmer’s market in one dish. “A lot of people are eating vegetarian and vegan just because it’s good,” Hennessee said. That’s a surprising statement coming from Chef Johnny Carlo of Medley, a new Triangle food truck set to change how the area thinks about healthy eating. But it’s also a testament to Medley’s commitment to really delicious, albeit nutritious food. “I cook in a way that if I like it, I know someone else will,” said Carlo. Medley was founded by Sam Sager and Zac Strom, who met at a previous job and realized a shared passion for community-centric businesses and healthy eating. Like Michelle Woodward at Diced, the two want to fill the industry gap for quick and convenient healthy food. 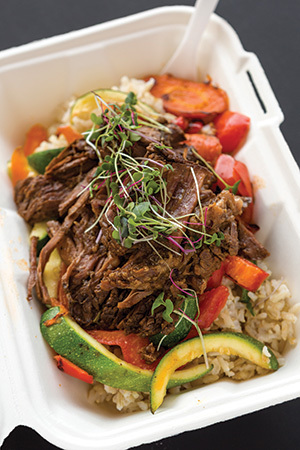 Medley’s wholesome food truck fare proves health food never has to be bland or boring. “Health food has a bad reputation. We want to prove it can taste good and be convenient,” said Sager. His personal experience with dietary restrictions — he has Celiac disease and Type 1 diabetes — has given him strong insight into the limitations healthy eating often brings. 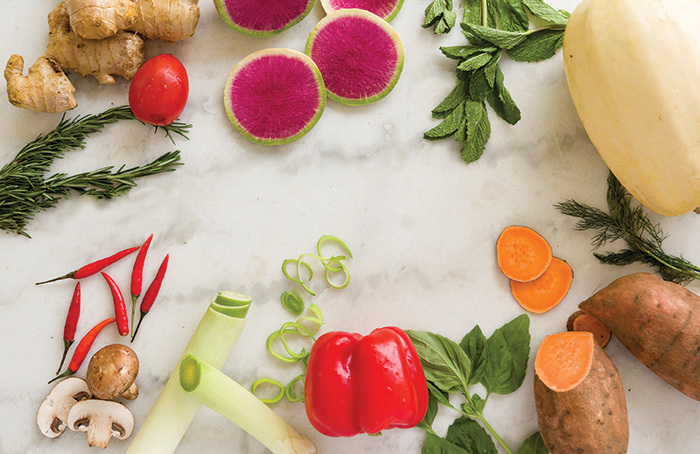 Medley’s goal is to make healthy eating accessible and more sustainable for everyone. The food truck’s mouth-watering centerpiece is the Cauliflower “Mac” and Cheese, a comforting and rich concoction featuring a traditional béchamel, a quartet of cheeses and of course loads of cauliflower. The pasta-free dish can be topped with bacon and grilled chicken or an assortment of veggies, including broccoli and crispy kale. “We’ve had parents say, ‘Don’t tell my kids it’s cauliflower,’” said Sager. Other offerings include breakfast scrambles and sauté bowls, all served with hearty helpings of vegetables, like the Braised Brisket Special served over sautéed bok choy, carrots, squash and a homemade bourbon reduction. Medley also wants to deliver its passion for healthy food beyond the food truck window, with a program called Medley at Home. A counterpart to cook-at-home services like Blue Apron or Hello Fresh, Medley at Home supplies pre-cooked, but not assembled, wholesome ingredients. “Busy families want fresh, healthy food, but don’t always have the time or resources to cook it,” said Strom. A Medley at Home package includes bases, like sweet potatoes and brown rice, proteins and an assortment of vegetables. Diced is amazing! Kale Me Crazy over at Waverly Place is another good option to get your veggies at too!